“He chose people that he believes in, and when we’re here we all believe in each other, and that’s the important thing.” Amen, my bald brother. 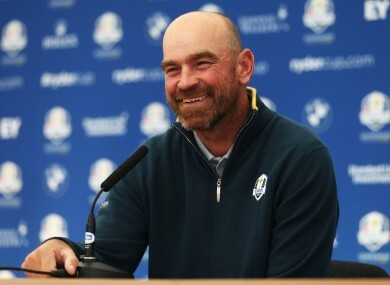 THOMAS BJORN FEELS the 2014 European Ryder Cup team is the strongest he has been involved in and credited Paul McGinley’s captain’s picks. The Dane has enjoyed a fine year on the European Tour and his form saw him earn an automatic spot in McGinley’s Ryder Cup team, meaning he will feature in the biennial contest as a player for the first time since 2002. Since then, Bjorn has been vice-captain three times, with the team winning on each of those occasions — including the ‘Miracle of Medinah’ two years ago when Europe overturned a 10-6 deficit on the final day under the leadership of Jose Maria Olazabal. Speaking about the 2014 line-up, Bjorn feels skipper McGinley made the right decision in choosing Lee Westwood, Stephen Gallacher and Ian Poulter to join those that had qualified automatically and believes the team is one of the strongest in the event’s long history. “There were no surprises for the players [from the captain's picks], there were no surprises for the media,” he said. “I think everybody was happy, we knew it was going to be a tough decision for Paul to make because a couple of guys who came very close and missed out have been fantastic in the last few Ryder Cups — like Francesco [Molinari] and Luke [Donald]. “But I think you can only make the decision that you make and when you’ve got to choose three from five or six it’s a difficult decision. “He chose people that he believes in, and when we’re here we all believe in each other, and that’s the important thing. You can’t pick everybody and it was a tough decision to make. Email “Bjorn: European team among the best I have seen... thanks to Paul McGinley”. Feedback on “Bjorn: European team among the best I have seen... thanks to Paul McGinley”.